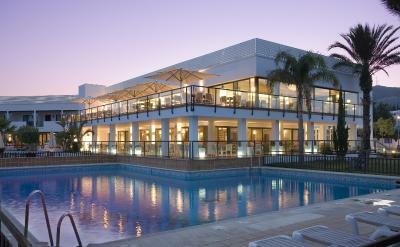 Lock in a great price for Parador de Mojácar – rated 8.7 by recent guests! Excellent in every way. Staff friendly and helpful. Reception were very helpful when we asked to change to a room which had patio overlooking gardens and sea view in the distance (initially we had room with sea view but as the beach is across the road the balcony was not very peaceful). Although a large hotel, it was low rise and it never appeared to be busy or over-crowded. Facilities were excellent; swimming pool for small children separate one for adults as well as a spa area; gardens, patio and lounge areas as well as the bedrooms+en-suite were relaxing and immaculate. A really lovely and very romantic 'Fine dining' evening meal can be had on the upper level outdoor terrace. Breakfast is self-service with a vast array of all kinds of options; tables also available on the terrace under shade. Great location with spectacular views. Didn't have time to use the pool area but it looked great! Plenty of on site parking. Hotel bar drinks reasonably priced. Restaurants and bars nearby within easy walking distance, plenty of choice. Great location - just over the road from the beach. The hotel is clean and modern. Has a quality feel. Lots of restaurants and bars within a 5 minute walk. Popular with Spanish - perfect if you’re looking for a holiday without ‘only fools and horses’ playing - like you get at some resorts...Mojacar is a lovely resort. Great service. In particular, the director of the reception team is outstanding! Nice building, less than 50 m from the beach, very decent rooms. The breakfast buffet is really fine. All in all a 4 Stars plus, with a minor deviation to a good 3 Stars for dinner. The place was clean and the staff very accommodating. They upgraded us when the first room they gave us was smelly. This is not a classic Parador, But rather a modern facility. The room was modern, spacious and clean. The reception staff were very helpful and polite. The parking was easy and free. The breakfast was generally excellent. The restaurant menu choice was good but the end product rather less so. Breakfast much better than Lorca, where we stayed in March. 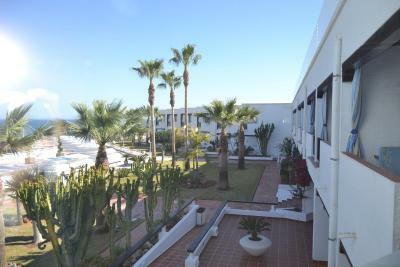 Bed a little firm for me but would certainly not hesitate to stay at Mojacar Parador again. Parador de Mojácar This rating is a reflection of how the property compares to the industry standard when it comes to price, facilities and services available. It's based on a self-evaluation by the property. Use this rating to help choose your stay! Located on the seafront of Mojácar Beach, this modern Parador offers stunning views of the Mediterranean Sea. 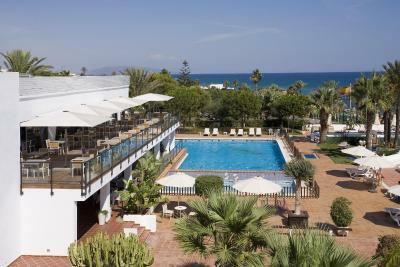 Set in charming gardens, it has a seasonal outdoor pool and 2 padel courts. 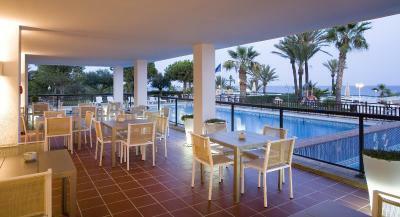 Parador de Mojácar features bright, stylish rooms decorated in neutral tones. They come with free Wi-Fi, a flat-screen TV and private bathroom. They also have a mini-bar and safe. 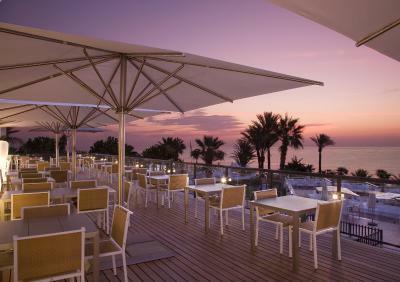 The restaurant at Parador Mojácar specializes in fresh fish and rice dishes. Guests can also enjoy meals on the restaurant’s terrace. The pool, surrounded by a sun terrace and palm trees, offers great views.During the summer months there is a free children's miniclub, free swimming classes and massages are available on request. Free parking is available on site and there are also facilities for guests to recharge electric cars for free. Mojácar town center is less than 1.2 mi away from the hotel. The Cabo de Gata Natural Park is a 20-minute drive from the hotel, and Almeria Airport is around 50 mi away. 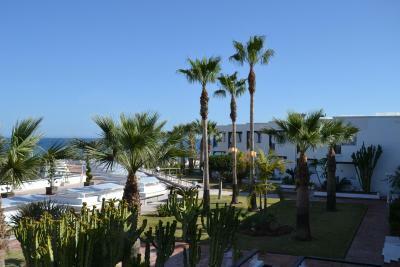 When would you like to stay at Parador de Mojácar? This room has a balcony or terrace and includes free Wi-Fi. Featuring a balcony with sea views, this room has 2 single beds and 1 bathroom. Featuring a terrace, this room comes with 2 single beds, a living area with a TV, mini-bar and phone and 1 bathroom. This room features a main area with joined twin beds and an extra space with separate twin beds. It has a private bathroom. 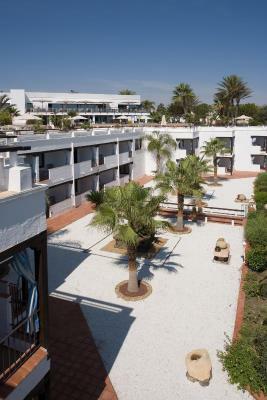 The Parador de Mojácar is located near the town's beaches. It enjoys one of the best microclimates in Spain, with an average temperature of 20°C and over 3,000 hours of sun each year. If you are looking for a place to enjoy tranquil beaches year round and partake in outdoor sports, this could be your destination. 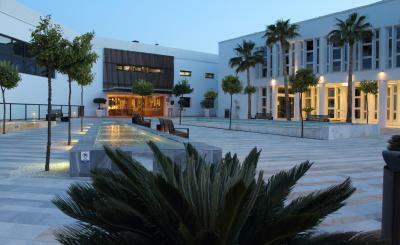 House Rules Parador de Mojácar takes special requests – add in the next step! Parador de Mojácar accepts these cards and reserves the right to temporarily hold an amount prior to arrival. When booking half board or full board rates, please note that drinks are not included. We are big fans of Paradores which are always interesting and this one is in an area of great natural beauty. But we already know the area well and came for a short romantic break, including a special lunch and massages. First the reception service was professional and friendly and our one bag was carried by a porter which is always a nice feeling. Next was lunch. There is a real celebration of local dishes reflected in the menus. We were spoiled for choice of unusual (to us) dishes. The portions were ample and we were given three small complimentary taster dishes before our food arrived. There is a tasting menu which we are going to go back for another day having seen what other diners were enjoying. The flavours were noteworthy, we had Pastela de Ave, Artichokes with Jamon and Arroz de Garucherras. The cheese cake, a sublime pannacotta-type ‘cake’, was just extraordinary. Super coffee, great service and everything you would expect with understated luxury. The massages were also excellent. Room service was also excellent, our beverages arriving quickly and hot. Just €2.50 for tea which is a standard price locally and with hand made biscuits, we expected much higher prices. All in all a very good value, top top experience. Nothing it was a really lovely Parador. Staff were very friendly and helpful. Good location would love to go there again in the summer when you could lay around the pool. Great location. It delivered the quality expectations of a Parador. Food was excellent at breakfast and at dinner and was reasonably priced. It would have been nice to eat in the hotel but too pricey for us. 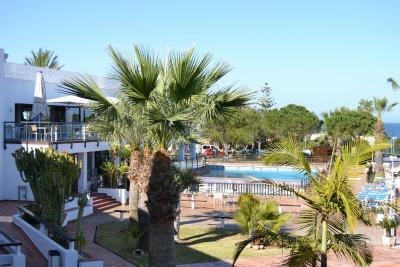 Great location near the beach and close to all facilities such as bars and restaurants. Plenty of parking space and free as is the wifi. Well furnished and spacious and room had all the amenities even tissues. Easy location from which to walk up to Mojacar Pueblo approx 2 kms away. Overall Mojacar is very clean mostly painted white and very enjoyable. The location and comfort room. Dinner was disappointing. A fabulous local soup to start full of flavour and then a totally bland main course of veal with no flavour at all! Pity. But the place is so nice that I accepted what came! Some cheaper hotels in Spain have tea and coffee makers - none here. No free water either. It seems the more you pay the less you get!! But really, I loved the place. Bed a bit hard, A/C heating a bit hard to manage, but working fine. Very friendly and helpful staff. Great room, well kept, clean, spacious. Facilities generally great. Only one suggestion and it is that there should be English speaking channels on the TV apart from news. It was warm, clean and the staff were very helpful. We enjoyed being left to ourselves, knowing we could have company should we wish to. The location was ideal and we used the buses which took us to where we wanted to go..